University of North Carolina's fake classes scandal escalates. Home Scandal and Gossip University of North Carolina’s fake classes scandal escalates. University of North Carolina’s fake classes scandal escalates. Why has the practice of fake classes been allowed to prevail in college? A term paper littered with grammatical errors which is barely even readable has become a potent visual symbol of the University of North Carolina’s fake classes scandal. 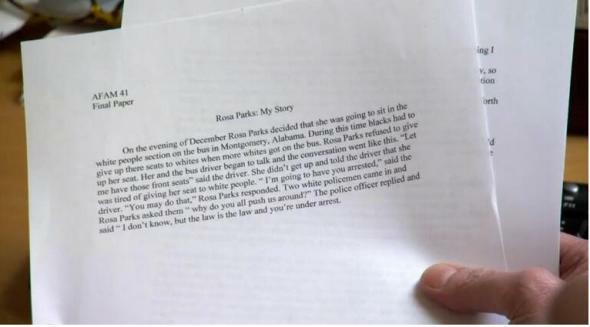 The one-paragraph essay on civil rights icon Rosa Parks earned an A- and was exposed by former UNC professor Mary Willingham, who spent 10 years teaching UNC’s athletes before she turned whistleblower on alleged classroom corruption. The essay came to light during an ESPN documentary timed to coincide with the March Madness basketball competition. It contains allegations that UNC athletes in danger of failing were encouraged to sign up for fake tutor groups designed to let students pass. The so-called ‘paper classes’ would be revealed to be no-show study groups that allowed semi-literate and in some cases, illiterate athletes to pass, thereby boosting their grade point average to meet the NCAA’s eligibility requirements. The anonymous essay, titled, ‘Rosa Parks: My Story’ attempts to recount the important moment on December 1, 1955 in Montgomery, Alabama, when Parks refused to give her seat up for a white man. Nevertheless the essay fails to even place the event in the past or give any gravitas to the momentous moment in American history. Tells the essay in it’s entirety: On the evening of December Rosa Parks decided that she was going to sit in the white people section on the bus in Montgomery, Alabama. During this time blacks had to give up there seats to whites when more whites got on the bus. Rosa Parks refused to give up her seat. Her and the bus driver began to talk and the conversation went like this. “Let me have those front seats” said the driver. She didn’t get up and told the driver that she was tired of giving her seat to white people. “I’m going to have you arrested,” said the driver. “You may do that,” Rosa Parks responded. Two white policemen came in and Rosa Parks asked them “why do you all push us around?” The police officer replied and said “I don’t know, but the law is the law and you’re under arrest. ‘Some of these college students could read at a second or third grade level,’ Mary Willingham, a UNC academic adviser since 2003 told ESPN. Williams confirmed the existence of ‘easy paper classes’ and alleged that students were guided to these classes by their academic advisors. Reflects slate: It seems fitting that this essay is making the rounds just one day after a National Labor Relations Board official ruled that football players at Northwestern University were not primarily students but rather employees of the school. That’s not to say Northwestern was running a similar scam (Disclosure: I’m an alum). But the point is that those who think that most big-time college athletes are at school first and foremost to be educated are fooling themselves. They’re there to work and earn money and prestige for the school. One individual who has admitted to the scam is Deunta Williams, a former student who played football at UNC from 2007 to 2010. Willingham’s whistleblowing began in 2011 after she became appalled that UNC, rather than educating its athletes was keeping them from needing to study at all. She began to release information to journalists about basketball and football stars who read at a grade school level. She confessed herself to steering many young men into lecture classes that simply did not exist. Willingham began to feed information about alleged academic fraud to the News & Observer in Raleigh. UNC is heavily invested in the $16 billion business that is college sports but Willingham’s revelations threaten that. When the teacher publicly came forward, UNC stripped of her supervisory title and denied the allegations of widespread academic fraud. UNC officials noted in a statement released after the ESPN report aired that little new information was revealed and noted that the university has used the episode as a chance to improve. ‘We have instituted numerous reforms, including new governance and accountability standards in our Academic Support Program for Student-Athletes,’ Vice Chancellor for Communications and Public Affairs Joel Curran said in the statement. In January senior UNC officials publicly condemned Willingham for suggesting that football and basketball stars couldn’t read well enough to get through college classes honestly. The fake classes were investigated in 2012 and Department head Julius Nyang’oro was listed as the instructor for the classes, although he calender revealed him to be abroad during some of these. In a CNN story that aired in January, Willingham said her research of 183 football or basketball players at UNC from 2004-12 found 60 percent reading at fourth- to eighth-grade levels and roughly 10 percent below a third-grade level. She said she worked with one men’s basketball player early in her 10-year tenure who couldn’t read or write. ‘I don’t believe it’s true,’ UNC coach Roy Williams said in January. ‘It’s totally unfair. I’m really proud of the kids we’ve brought in here. … We haven’t brought anybody in like that. We’ve had one senior since I’ve been here that did not graduate. Admissions director Stephen Farmer, a review group member, said his office won’t hesitate to tell coaches no if a recruit can’t handle coursework. ‘We do not rubber-stamp anyone for admission,’ Farmer said. In December, a grand jury indicted Nyang’oro for receiving $12,000 to teach one of the no-show classes in summer 2011, a lecture course that was instead treated as an independent study requiring a paper. The enrollment was 18 football players and one ex-player. In the wake of the scandal, UNC has admitted to and apologized for the fake classes. However Willinghman says she has never been contacted by the NCAA to look into what she knows. Mary Willingham has also told that she has received death threats and hate mail as the matter once again takes precedence.